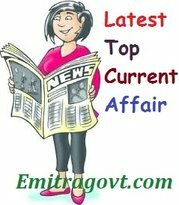 Current Affairs Question 2017: Looking for 1st August Current Affairs? Then start your Quiz right now by answering them. Here in this article, we are giving the Current Affairs Quiz with Questions and Answers. As many people are preparing for various government exams it became mandatory for them to get a grip over the current affairs as in most of the tests are based on Daily Current Affairs. By taking this kind of Current Affairs Quiz candidates can eventually get hold of what they have been working on. Contenders can trust us as we will update all the latest Current Affairs in this quiz. For more such quizzes check our site Emitragovt.com regularly as we will update the Daily Quiz for current affairs. 1. Mukhtar Abbas Naqvi launches Jiyo Parsi Publicity Phase-2 in Mumbai. 3. The Punjab government has recently announced the launch of its flagship ‘Apni Gaddi Apna Rozgar’ scheme by flagging off over 100 uber MOTO bikes. 4. The four Arab nations boycotting Qatar have announced willngness to initiate a dialogue with the country, bringing the hope of some sort of resolution to the gulf crisis. 5. India and Pakistan will hold talks on two hydrpower projects, namely Kishenganga and Ratle, under the 1960 Indus Waters Treaty (IWT) at the World Bank headquarters in Washington. 6. The Indian women’s basketball team defeated Kazakhstan 75-73 in a thrilling contest to climb to Division A of the FIBA Asia Cup 2017. 7. The World Bank has approved a total of USD 570 million for two projects in Bangladesh to improve health, nutrition, and population services and strengthen the country’s public procurement. 8. Ravi Mittal, additional secretary in the Finance Ministry, has been appointed a part-time member on the board of Irdai. 9. Mumbai’s Aditya Patil and Suhaani Lohia have clinched bronze medals at the Asian School Chess Competition in China. 10. India shooter Tejaswini Sawant of Maharashtra won the women’s 50m rifle 3 positions event in the XVII Kumar Surendra Singh Memorial Shooting championship. 11. The Centre announced to set up a 220-acre mega electronic systems design and manufacturing cluster in Assam. 12. Senior leader of Uttarakhand Kranti Dal and state agitator Ved Uniyal passed away. He was 65. 13. Indian boxers packed quite a heavy punch at the 48th Grand Prix Usti Nad Labem, clinching five gold, two silver and one bronze medal at the event in the Czech Republic.